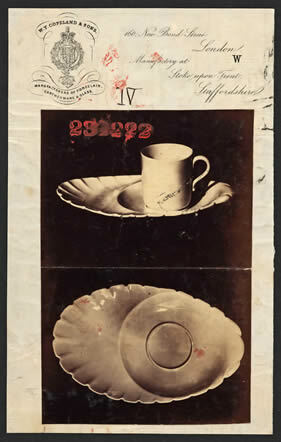 Design Registers | View by object | Ceramic shapes | Tableware | cup with enlarged stand Feb 6th 1872. Copyright Extended for 2 years commencing on the 24th July 1872. You are here: Home > Exhibitions > Design Registers > View by object > Ceramic shapes > Tableware > cup with enlarged stand Feb 6th 1872. Copyright Extended for 2 years commencing on the 24th July 1872. 231222 - William Taylor Copeland & Sons - 24 July 1869 - cup with enlarged stand Feb 6th 1872. Copyright Extended for 2 years commencing on the 24th July 1872. Printed factory paper 160 New Bond Street, London. Manufactory at Stoke upon Trent, Staffordshire. This shape is illustrated in Geoffrey Godden, Staffordshire Porcelain, Grenada Publishing Limited, St Albans, England, 1983, page 118, plate 678. 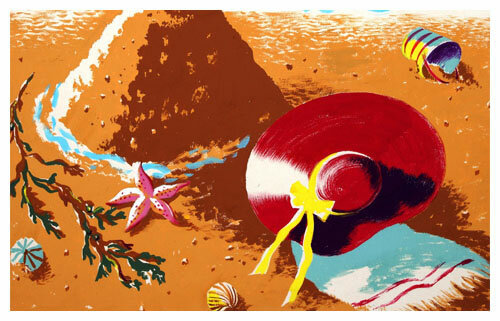 This design anticipates by 100 years the 'TV' supper sets of the 1960's.